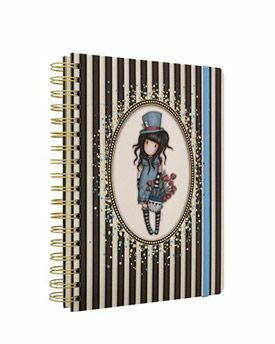 Large Wiro-bound Journal 'The Hatter' design. Measures approx. 15cm x 21cm x 3cm, 160 lined pages and 160 plain pages. A stylish home to capture creativity, this large wirobound journal is perfect for doodles, sketches, thoughts and ideas! The cover is adorned with striking monochrome stripes and the captivating "The Hatter" artwork surrounded by a sophisticated, embossed, gold frame. With delicate sky blue and gold speckles to detail, the notebook has a blue elasticated strap to keep closed and a gold effect wiro-binding for an extra chic look. Separated by a page featuring the endearing The Hatter, the interior is split into both lined and plain pages for an oh-so versatile writing experience. Bold and beautiful, it is a must-have Gorjuss stationery essential!